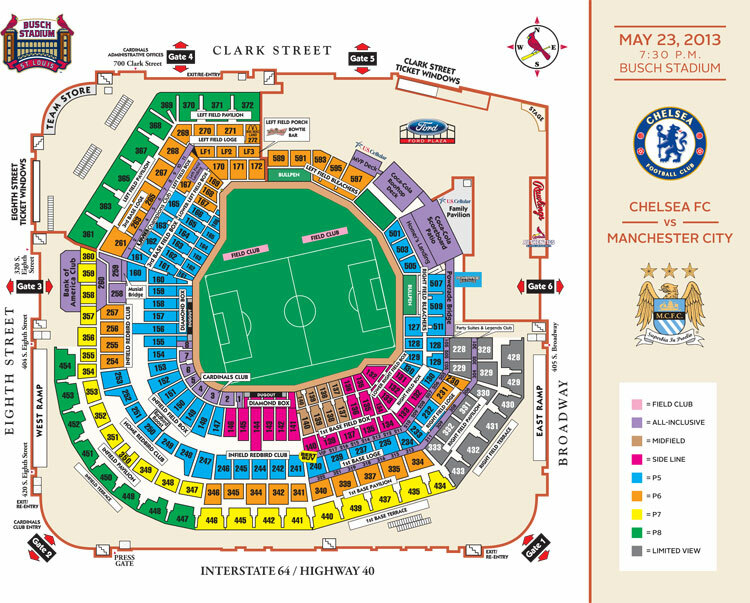 match at Busch Stadium on May 23rd. * All Field Club, Midfield, Sideline and All-inclusive ticket buyers for the match on Thursday will receive a FREE ticket to the Chelsea FC training session on Wed, May 22 at 5:30 pm. Seats will be added on the field while some in the upper deck in right field won’t be sold, bringing capacity for the game to about 42,000. Bryant said they’re hoping for a sellout, with fans coming from outside the area to see the game. Fitting a soccer field into Busch Stadium will be a tight squeeze. The field will run from in front of the visiting dugout on the third-base line, along the first-base line, to the right field stands. It will be just short of 100 meters long, the minimum allowable length for an international match, which would probably preclude playing World Cup qualifying matches here. But because this match is an exhibition game, being a few feet short is permissible.